SEATTLE – The Transportation Security Administration (TSA) and Port of Seattle are asking travelers to get their game plans ready for a busy spring break at Seattle-Tacoma International Airport. 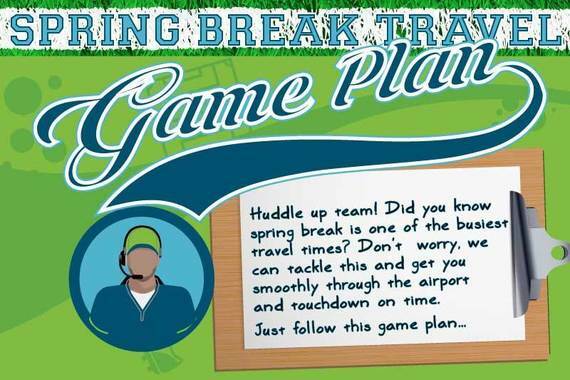 The peak spring break travel period starts Thursday, April 6 and goes through the following weekend. TSA anticipates screening more than 215,000 passengers through the security checkpoints at Sea-Tac Airport during the four-day period starting Friday, April 7 - a 3 percent increase over last year. The busiest day is projected to be Friday, April 7 when TSA projects to screen more than 57,000 travelers. Overall, the Port expects more than 537,000 will travel through Sea-Tac (includes all departures, arrivals and connecting passengers) during that four-day period. Spring break 2017 is expected to be the busiest time so far this year at Sea-Tac. Travelers can make things a little easier by being prepared long before heading to the airport. Being ready and knowing the rules can help speed up security checkpoint lines for everyone. Consider Public Transportation: Sound Transit Link light rail is an environmentally friendly way to beat possible traffic jams on the way to the airport. Another option, have someone drive you to a nearby light rail station and take the train to the airport. There are also several bus routes and private shuttles available on Sea-Tac’s website. If you do have to drive: Check WSDOT’s traffic info page – real-time updates and live traffic cameras can help you avoid any traffic headaches by finding alternate routes. Check weather and airline issues: Flight delays can happen due to unexpected computer or weather problems. Don’t get stuck at the airport without checking weather in Seattle and your arrival city along with your flight status first. Arrive early: Consider adding time in your travel plans for traffic, parking, rental car returns and airline check-in. Arrive two hours prior to your flight departure time for domestic travel and three hours for international flights. Check airport monitors for checkpoint times: Monitors in the ticketing area show which checkpoints have the shortest wait times. A brief walk may save time in line. Include your Known Traveler Number in your airline reservation: If you have enrolled in TSA Pre✓®, Global Entry, NEXUS, or SENTRI, be sure you include your Known Traveler Number in your airline reservation. This will make you eligible for TSA Pre✓® on a consistent basis. TSA Pre✓® passengers flying on any of 30 participating airlines do not need to remove their shoes, laptops, liquids, belts or light jackets at airports nationwide. TSA at SEA operates a dedicated security checkpoint for TSA Pre✓® passengers. Look for it at checkpoint 4, behind the Alaska Airlines ticket counter. Tweet or Message AskTSA: Unsure if an item is allowed through security? Questions about security screening procedures? Get live assistance by tweeting your questions and comments to @AskTSA or via Facebook Messenger, weekdays from 5 a.m. PDT to 7 p.m. PDT and weekends from 6 a.m. PDT to 4 p.m. PDT. You can also reach the TSA Contact Center at 866-289-9673. Prepare for security: Have a valid ID and boarding pass readily available, and remove large electronics, including laptops and liquids bag from carry-on baggage. Avoid over packing your carry-on bag. Consider checking bags when feasible. Follow the liquids rule: Liquids, gels, aerosols, creams and pastes must be 3.4 ounces or less and all containers must fit inside a single quart-size plastic bag and be placed in a bin for carry-on baggage screening. This includes sun block and tanning lotions. Call TSA Cares: Travelers or families of passengers with disabilities and/or medical conditions may call the TSA Cares helpline toll free at 855-787-2227 at least 72 hours prior to flying with any questions about screening policies, procedures and what to expect at the security checkpoint as well as arrange for assistance at the checkpoint. The Transportation Security Administration was created to strengthen the security of the nation’s transportation systems and ensure the freedom of movement for people and commerce. TSA uses a risk-based strategy and works closely with transportation law enforcement and intelligence communities to set the standard for excellence in transportation security. For more information about TSA, please visit our website at tsa.gov. Seattle-Tacoma International Airport - Operated by the Port of Seattle, Seattle-Tacoma International Airport (SEA, KSEA) is ranked as the 9th busiest U.S. airport, serving nearly 45.7 million passengers and more than 366,000 metric tons of air cargo in 2016. With a regional economic impact of more than $16.3 billion in business revenue, Sea-Tac generates 171,796 jobs (109,924 direct jobs) representing over $2.8 billion in direct earnings and more than $565 million in state and local taxes. Twenty-four airlines serve 83 non-stop domestic and 24 international destinations.